The Friday Night Event You DO NOT Want to Miss! You’re coming, right? 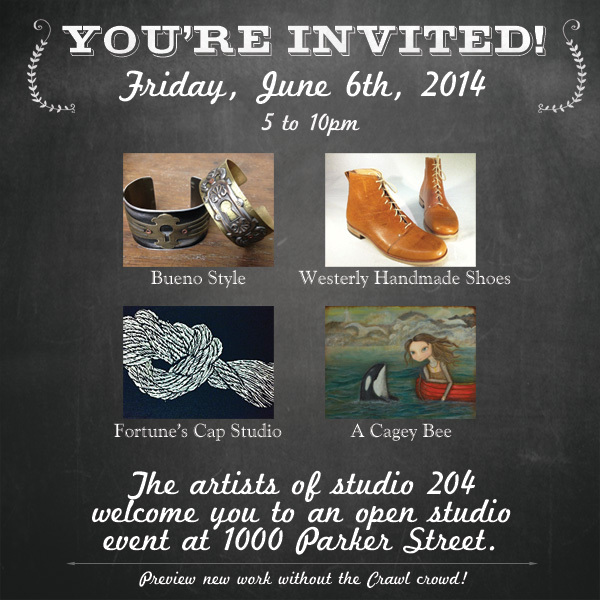 The fabulous artists I share my studio space with decided weeks ago that tomorrow night – June 6, 2014 – would be our first open studio event/party. And then we promptly all got busy with various projects & kind of forgot about it. Whoops! We may not have printed up flyers. I didn’t even create the Facebook event listing until a few days ago. But that is ALL THE MORE REASON why you should come! It’s going to be a low key, super casual get together with some of my favorite people in the world. There will be art on the walls to look at (including some new paintings I’m super excited about), but unlike most of my events, nobody is planning to sell work or make money. This is more about having a few drinks, nibbling on snacks, throwing a record on & getting a chance to actually have conversations without feeling rushed or hurried along by a throng of strollers like at the busy markets. As for my new paintings? They’re bigger than I usually paint, so I’ve been having trouble getting decent photographs of them. After yet another disappointing shoot in the lovely shaded light of my balcony, I decided to splurge on a fancy new lighting set up. OK, “fancy” might be overdoing it a bit. 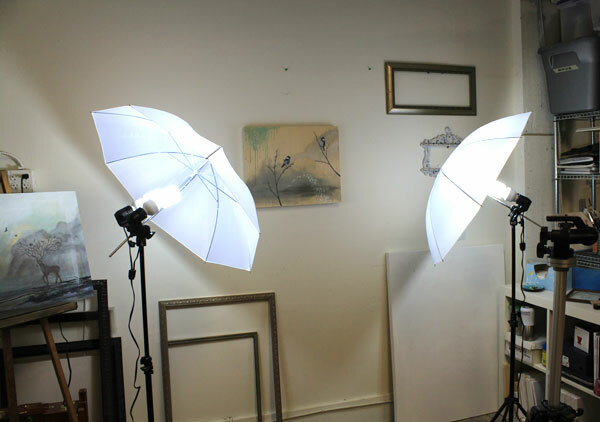 I’m sure professional photographers would scoff at this continuous lighting set up, but I’m quite thrilled with now having the ability to photograph my paintings at any time of the day. Being able to keep everything level makes a huge difference on these bigger canvases (though the one in this photo is actually the smallest one of the new batch). 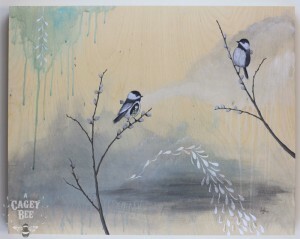 I’m really loving my new series of bird paintings. The backgrounds are looser, more abstract and organic. It’s been really enjoyable to breathe & let the paint flow. Hopefully you can stop by & check out the new work for yourself! Next postSomething Big Is Coming!